Colorful Classic Decor in London? Yes, indeed you read that right. Colorful. While white decor may be favored far and wide here in Lovelyland, we are not rigid or blind to the beauty of colorful interiors. Energizing and stirring, a colorful room can lift the spirit, transport the heart, and awaken the senses in lovely mysterious ways! 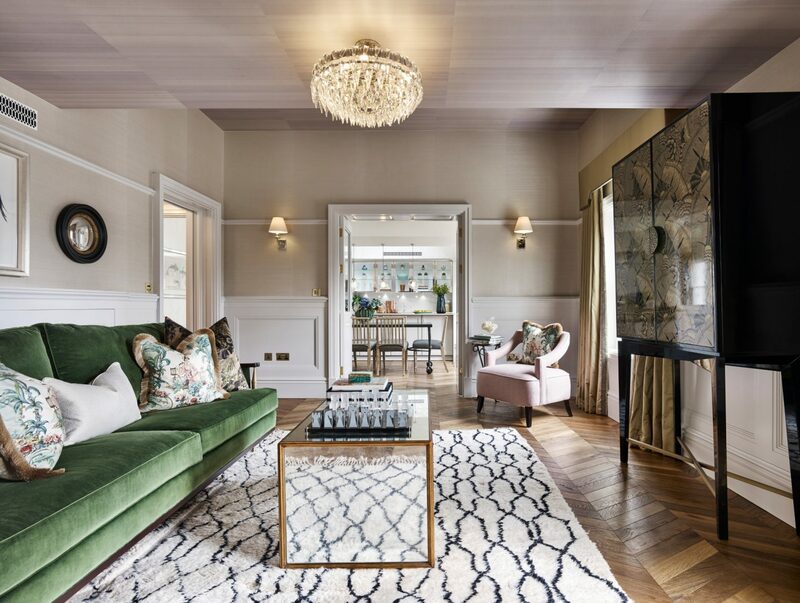 Colorful Classic Decor in London Inspired by ‘Out of Africa’ explored today is the work of Studio L London, who harmonized multiple influences in a luxurious three-bedroom London apartment. 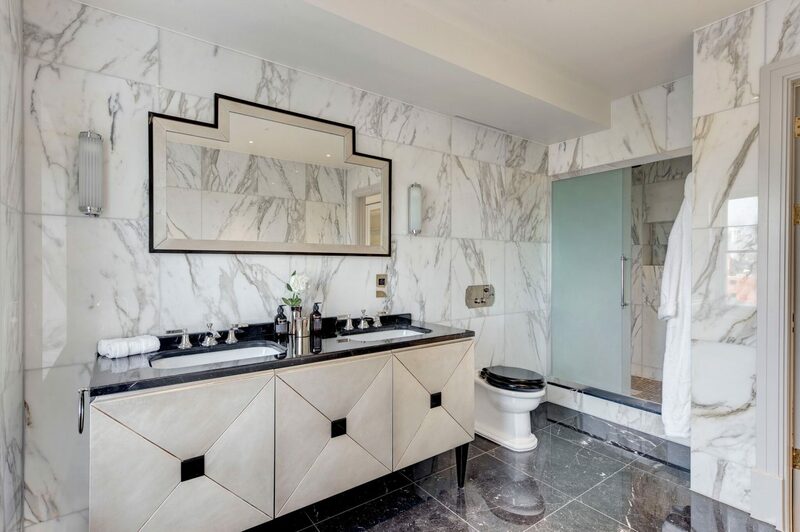 Today it’s a pleasure to spotlight Studio L London, with designer Laura Marino at the helm, who takes a discerning, unexpected, aspirational-with-a-touch-of fantasy approach to varied bespoke projects. 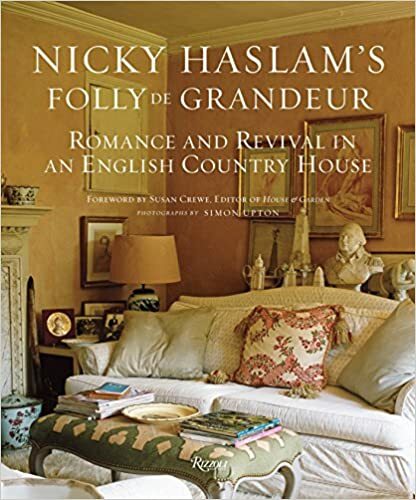 ‘Out of Africa,’ British Colonial, the softer side of Victoriana, and even a nod to American preppy style (raise your hand if you wore a preppy pink polo with Kelly green and boat shoes three decades ago!) were woven into a cohesive design plan. Icing on the cake? Studio L London shares sources for materials as well as expert advice for getting this decor look (stay tuned for the follow-up with that advice!). 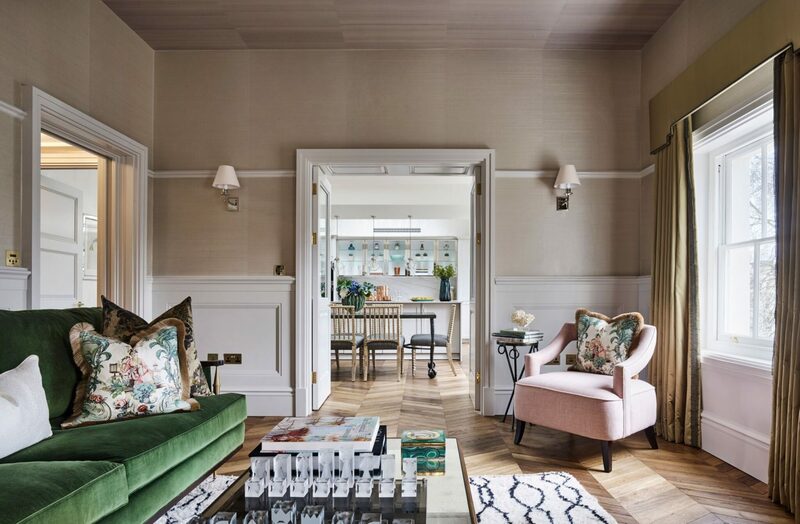 Colorful, elegant, and also layered with bespoke luxury…this sitting room is lovely, indeed! Pink and green together are lovely indeed! Studio L London’s interior design direction was inspired by at least three gorgeous daydreams. Firstly, 1985’s ‘Out of Africa. Secondly, leafing through a Slim Aaron’s book (here’s one!). 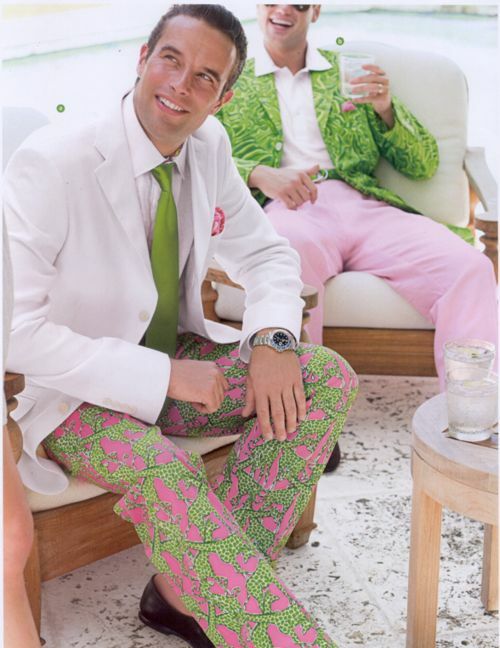 Finally, a prepster pink mood (aren’t the dapper gents above wearing it well?). Ahhhhhh, Out of Africa. Can you believe it has been 33 years since its release? While you will not find plantation house interiors or interior design in this clip, a beautiful blast from the past is worth taking a moment for Robert Redford and Meryl Streep. Design: Studio L London. Ceiling wallpaper: Phillip Jefferies JAPANESE SILK in PEARL ICE (find more options here too). Wallpaper (above paneling): Phillip Jefferies GLAZED ABACA in BRUSHED SILVER. 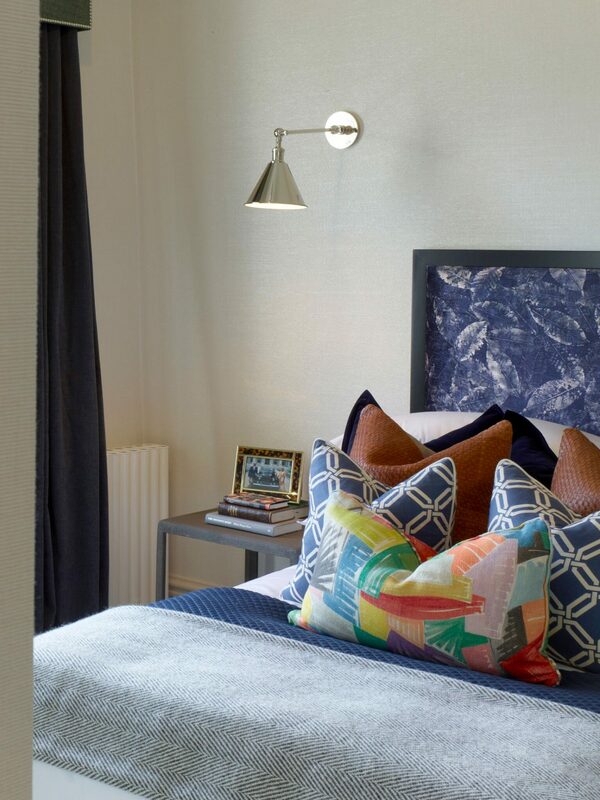 Ceiling and Wall lights: Visual Comfort (also see more HERE too). Coffee table: Julian Chichester (see more options HERE). Armchairs: Bespoke Sofa. Curtains & Pelmet fabric: Elitis “Smile II”. Chess Board: Jonathan Adler (find lovely options HERE too). Art: Trowbridge. TV Cabinet: designed by Studio L with Ralph Lauren (More Ralph Lauren HERE) wallpaper lacquered onto the front, made by Hyde House Furniture. Area Rug: Beni Ourain(also see lovely options HERE) . Sofa: Ben Whistler, upholstery by Gaston y Daniela. Photo by Nick Rochowski. Colorful, elegant, and also layered with bespoke luxury…certainly lovely, indeed! 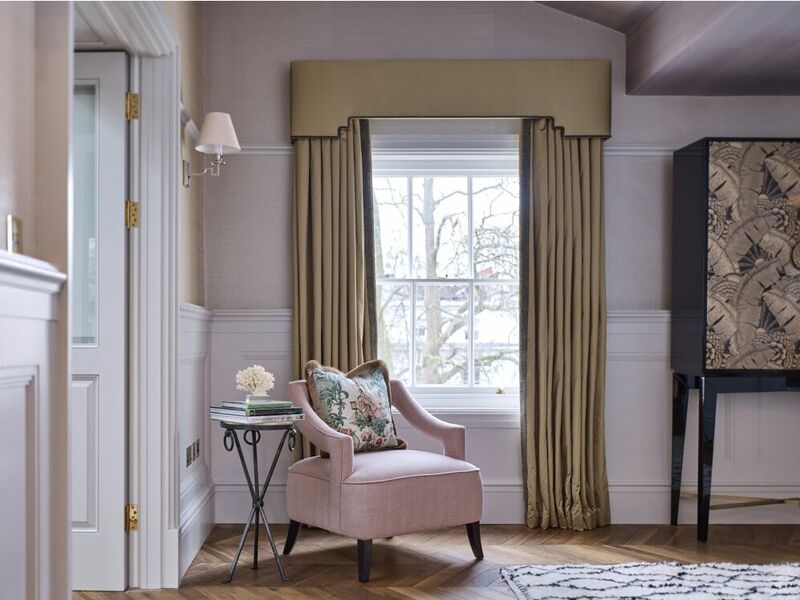 Just in case you also love an elegant interior with blush pink. In case you love rich herringbone wood flooring too. Colorful, elegant, and also layered with bespoke luxury…decidedly lovely, indeed! Design: Studio L London. Ceiling wallpaper: Phillip Jefferies JAPANESE SILK in PEARL ICE (also find more options here). Wallpaper (above paneling): Phillip Jefferies GLAZED ABACA in BRUSHED SILVER. Ceiling and Wall lights: Visual Comfort (see more options HERE too). Coffee table: Julian Chichester (see more options HERE too as well). Armchairs: Bespoke Sofa. Curtains & Pelmet fabric: Elitis “Smile II”. Chess Board: Jonathan Adler (find lovely options HERE as well). Art: Trowbridge. TV Cabinet: designed by Studio L with Ralph Lauren (Also see more Ralph Lauren HERE) wallpaper lacquered onto the front, made by Hyde House Furniture. Area Rug: Beni Ourain (see lovely options HERE as well). Sofa: Ben Whistler, upholstery by Gaston y Daniela. Photo by Nick Rochowski. TV Cabinet – designed by Studio L with Ralph Lauren wallpaper lacquered front, made by Hyde House Furniture. FARROW & BALL’S Cornforth White (find here) is the paint color on all the wood work (paneling, doors, and mouldings). For a story about choosing the right white paint, also see this. 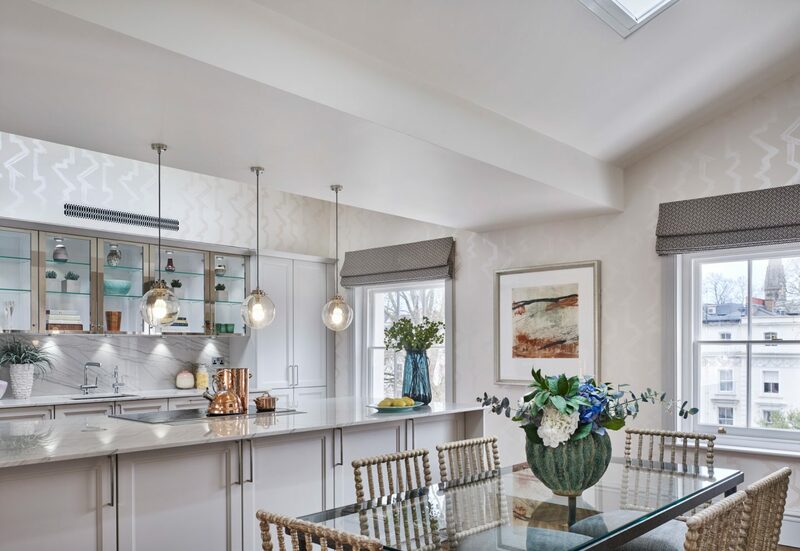 Additionally, this lovely home’s light and bright kitchen was shortlisted by the International Design and Architecture Awards (for Kitchen Design Over £50,000). In case a luxurious, bespoke classical kitchen also rocks your world…certainly lovely indeed. Bed: Bespoke Sofa in Verel de Belval fabric. 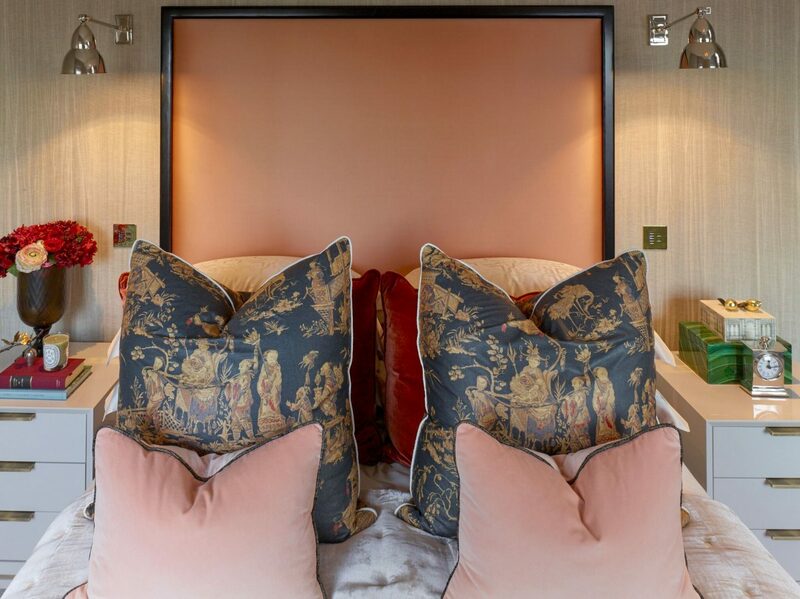 Cushions: Custom in Verel de Belval, Schumacher (find options HERE) . 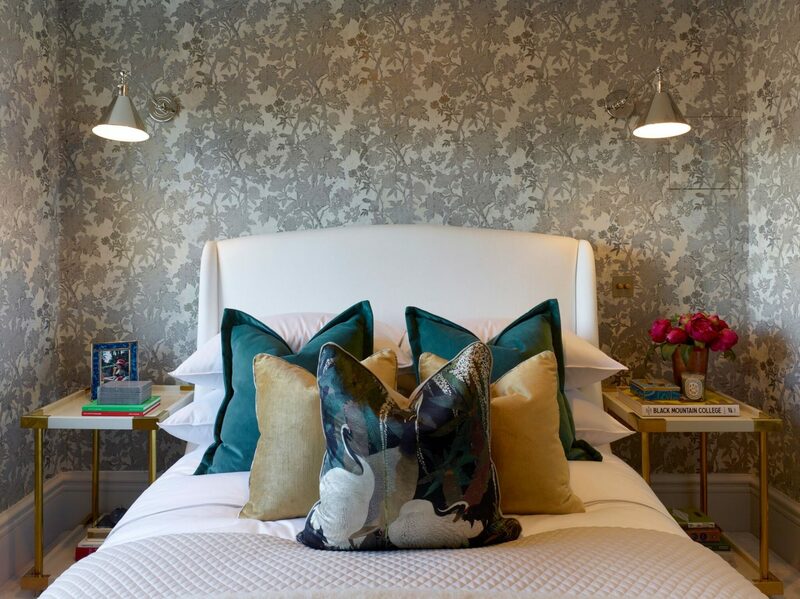 Wallpaper: Aba Interiors. Colorful, elegant, and also layered with bespoke luxury…certainly lovely, indeed! 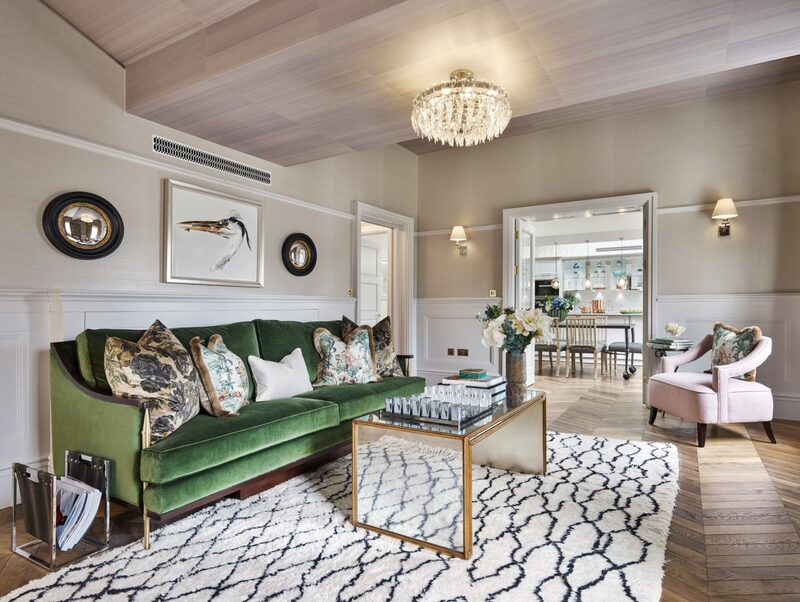 Bespoke luxury and also elegance: Colorful Classic Decor in London…decidedly lovely indeed. Colorful, elegant, and also layered with bespoke luxury…certainly lovely, indeed! Just in case you also need more Liberty of London in your life. Colorful, elegant, and also layered with bespoke luxury…certainly lovely, indeed! 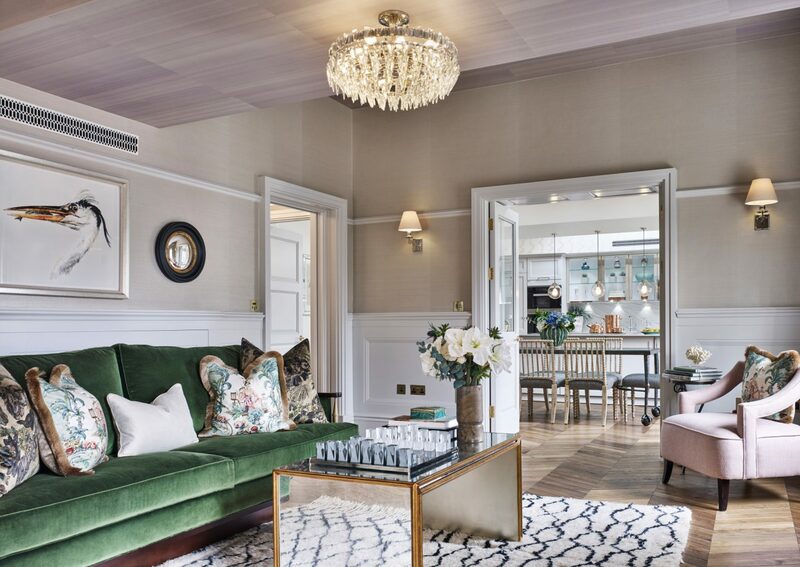 Colorful Classic Decor in London and also bespoke luxury…certainly lovely indeed. Colorful, elegant, and also layered with bespoke luxury…decidedly lovely, indeed! For additional classic decor inspiration, also see these kitchens, this architecture, and this house tour. 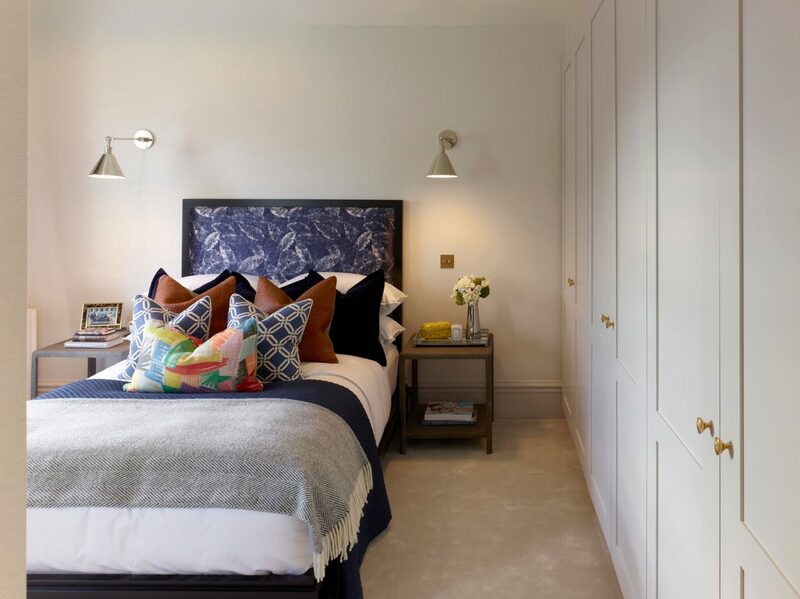 Do visit Studio L London for more inspiration, and stay tuned for their expert decorating advice! 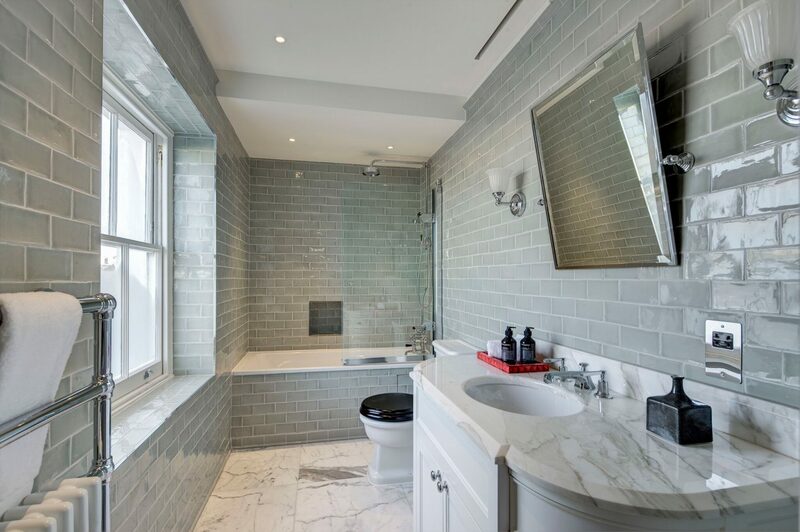 Next Post Before & After: Fussy Traditional to Urban Chic! If there’s one thing that makes my head snap, it’s any mention of Africa. 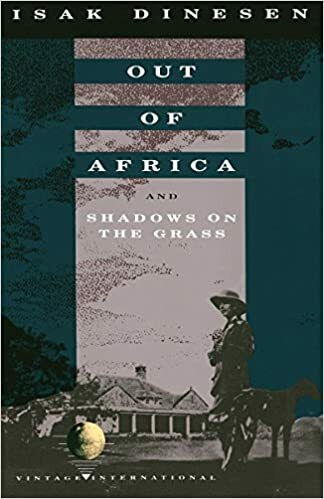 I lived in Kenya for two years, and I saw the premiere of “Out of Africa” in Nairobi–the audience reacted to the lines in Swahili and Kikuyu before the subtitles came up, which was special. I of course visited Karen Blixen’s house, and one of my favorite hangouts was the (Lord Delamere) terrace of the Norfolk Hotel. I just now looked online and am mightily dismayed to see they have replaced the wooden chairs, which were SO comfortable and so classic. I took about a dozen photos of them, intending to find identical ones for my home one day (the old ones, not the banal new rattan versions–I have nothing against rattan but the old ones were so perfectly 1900s-1920s). In fact, I so loved the simple but elegant colonial style, mixed with local art, that I bought a book, “Safari Style,” full of interiors that, to me a least, look current decades later (decades! when did that happen?). I still look to it for inspiration. I really like the London interpretation. Green: duh. As one of my Kenyan students told me, “Green is beautiful because it is the color of living things.” Pink does indeed play well with green, and I certainly saw plenty of it. Also vivid blues and bright reds. No shy colors. But there would be much more wood. Furniture was made of wood, parquet floors, lots of reddish browns, which matched the earth outside. 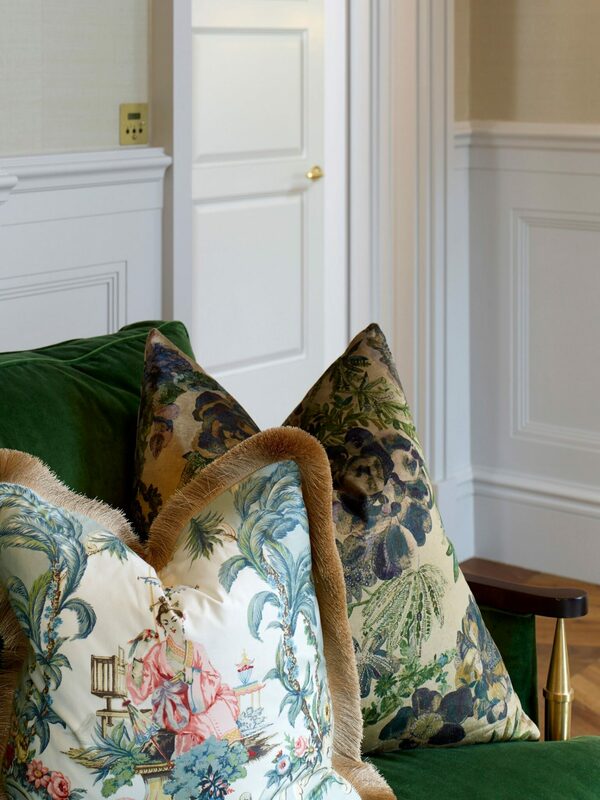 I am always pleased to see suggestions for incorporating the elements of Africa in our UK homes. I had a trip booked for Kenya in 2006 but an unfortunate & tragic accident forced me to cancel. Taste of France’s comment has me thinking it’s time to make that trip. I’m not picking up on the out of Africa theme in the above photos. They seem more contemporary than British colonial. 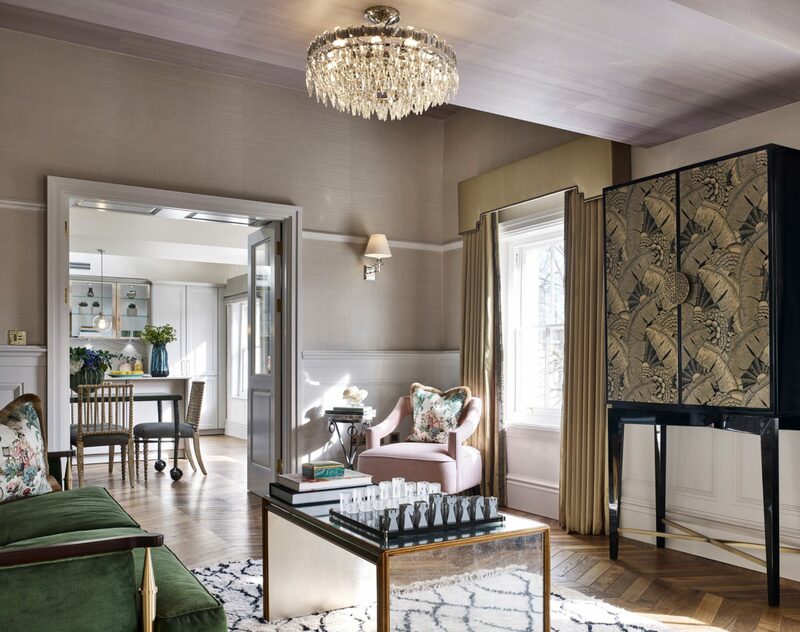 I love the London rooms with their rich colorful accents! They have an eclectic, well-traveled feeling.